Magic Cabin Rabbit Hutch Review & Giveaway CLOSED! Spring is here and so are all of the cute Spring time toys! I know growing up I loved my rabbits, I loved taking them out of their hutch and cuddling them, then putting them back and feeding them. Unlike my kids, I lived out in the country, so we could have rabbits growing up. We have our animals in our home, but no bunnies. I dont think the cats would be too nice to them so I dont want to take that chance. So when my daughter keeps trying to hint to me that she wants a bunny I started looking for alternatives for the time being. Well I found the perfect alternative at one of my favorite online toy stores! I found the cutest little rabbit hutch with little stuffed rabbits that can live inside of it at Magic Cabin! This hutch is just too cute! It is handcrafted and made from pine, with hardwood doors and roof! The hutch also has two little cozy areas for the little bunnies to sleep in! Then you have the cute little bunnies that go inside of this incredibly adorable hutch. These cute little bunnies are also handmade and are made of felt so they are not only cute but they are also cuddly! 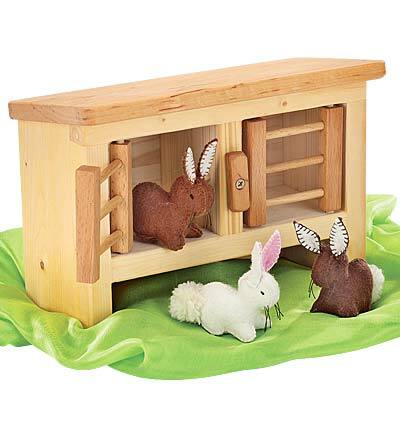 I think the Rabbit Hutch with Bunnies from Magic Cabin are the perfect alternative to the real thing and when I gave it to my daughter, she was very pleased and she just adores this cute set!! This set could also make for a great Springtime decorative piece for any home!!! I was given the Rabbit Hutch with Bunnies to review for my readers, courtesy of the wonderful people over at Magic Cabin, and the wonderful people from Magic Cabin would like to give one of my amazing readers their own Rabbit Hutch with Bunnies! This set could also make for a great Springtime decorative piece for any home!!! Like Magic Cabin on Facebook and tell them hi for me!! Then come back here and leave me your email with this entry!! This giveaway is open to US residents. This giveaway will end at midnight on May 21,2011. Winner will be chosen at random.org and will be given 48 hours before another winner will be chosen. All products for reviews and giveaways are given as a sample from the companies. All opinions in reviews I conduct are my own. I was not paid to say anthing or review any products. Next Post Crane Frog Air Purifier Giveaway CLOSED! I like Magic Cabin on facebook, left a comment under Magic Cabins Happy Easter today that you said HI – I'm victoria liesterflophasit at yahoo dot comThank you for the chance to enter! janmessali (at) gmail.com I follow you via GFC. Oh, it's so cute! I Liked Magic Cabin on Facebook and told them hi for you.